Ben Wheeler had a night to forget. AUSTRALIA made history by recording the highest ever successful international T20 run chase against New Zealand at Eden Park on Friday night. The visitors hauled in the Black Caps' 6/243 with five wickets in hand and seven balls to spare on a horror night for bowlers on both sides. 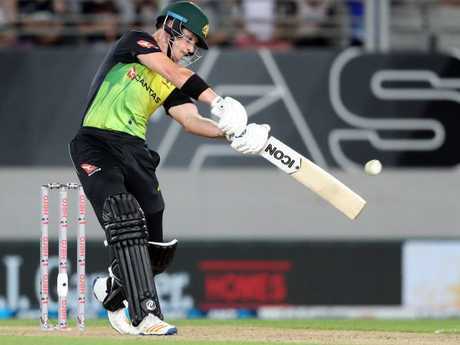 Martin Guptill blasted his second T20 international ton but it wasn't enough as a 121-run opening stand between David Warner and D'Arcy Short put the Aussies on course for victory. Here are the talking points from the clash. 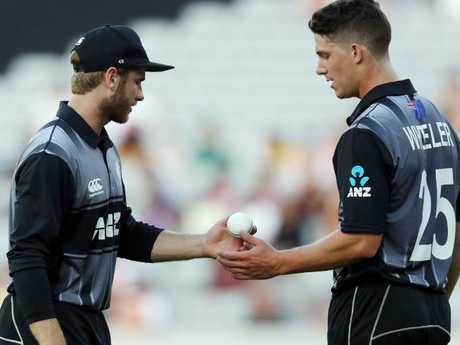 Black Caps left-arm bowler Ben Wheeler had a night to forget as the Australian batsmen picked him apart in their dramatic victory at Eden Park. From 3.1 overs, Wheeler went for 64 runs without taking a wicket and his overall economy finished at a whopping 20.21 runs. In doing so, Wheeler claimed the third-equal most runs conceded in an international T20 innings. Three others share this position on the list - James Anderson, Sanath Jayasuriya and Andrew Tye, who against the Kiwis last night also went for 64 runs. Tye was better than Wheeler last night though, grabbing the wickets of New Zealand openers Martin Guptill and Colin Munro. He was also able to finish all of his four overs, something Wheeler failed to do. 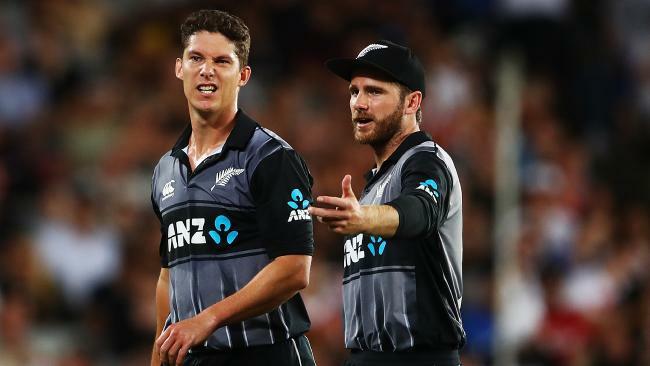 Trent Boult had to come in and complete Wheeler's final over when he was ruled out of the attack after bowling two delivers above waist height - an error in his game that probably saved him from the humiliation of the most expensive T20 international figures ever. That record is held by Irishman Barry McCarthy who was dispatched for 69 runs in four overs against Afghanistan last year. 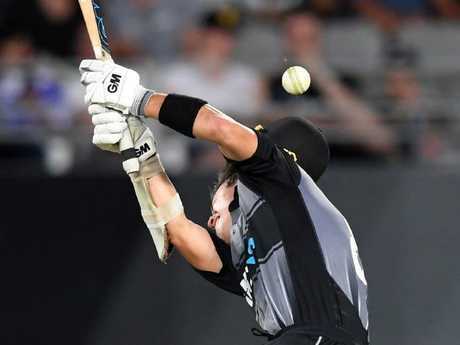 If Australian opener D'Arcy Short sought inspiration from the Eden Park crowd, he got it when Ross Taylor hit the ball in this picture over the fence from the penultimate delivery of New Zealand's innings. On the one-hand, literally, we have 20-year-old Victoria University accountancy student Mitchell Grimstone taking a crowd catch beyond deep mid-wicket which earned him $50,000 from sponsors Tui. On the other hand, a bird has been flipped by a terraces warrior safe in the knowledge that Short has few avenues for recourse as he cops the abuse. The moment was captured perfectly on Twitter by sports journalist Matt Chatterton with the caption: "Salt in the wound there". Bravery's a doddle when you're ahead. Little was our middle-finger saluter to know that in a few minutes Short would be applying the salt as he hacked into the Black Caps bowling attack on his way to 76 off 44 balls. The ball appeared to spend more time in the stands than on the field as both bowling attacks were dismantled on one of cricket's most unforgiving arenas. The 32 sixes equalled the world record in the format from an India vs West Indies match at Lauderhill in August 2016. "I copped it a bit when I was fielding, but I switched it out and tried to stay in the game. It was just banter," Short said. "That's the smallest field (I've played on) but the atmosphere was great. I just trusted my swing, knowing I could clear the boundary because those at home are considerably bigger. "I think we brought it back well. We could've been chasing 260-270 at one stage." Short combined in a ballistic opening stand of 121 off 8.3 overs with David Warner, who was bowled by Ish Sodhi for 59 from 24 balls. The powerplay was worth 91 runs accumulated through overs from Trent Boult (11), Ben Wheeler (16), Tim Southee (16), Boult (8), Wheeler (22) and Southee (18). On a night bowlers from both sides will want to forget, only Sodhi and Australia's Ashton Agar conceded less than 10 runs per over. Unfortunately for captains Kane Williamson and Warner, they couldn't place fielders on the outer oval or the second tier of the stand. 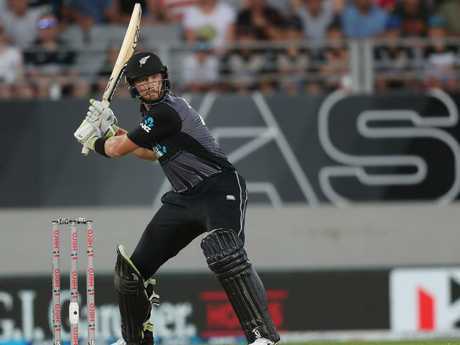 "To put 240 on the board and lose a game is disheartening, but there's no real time to dwell on it," Martin Guptill said, after making his second T20 century and the second fastest by a New Zealander with 105 from 54 balls. "Any time you score 90 in the front six (like Australia) is going to put pressure on any score. 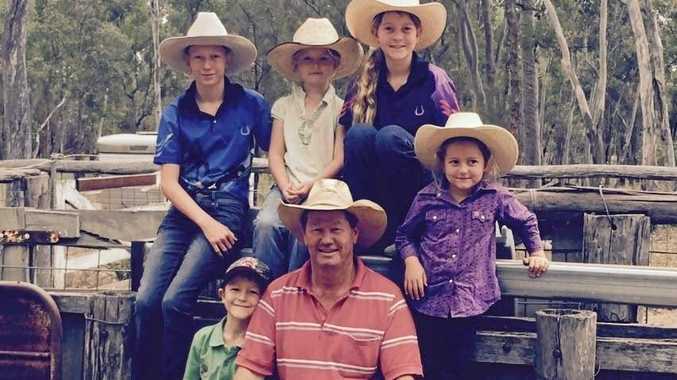 They chanced their arm and it paid off." Bowlers had no reasons to smile at Eden Park but at least Aussie quick Billy Stanlake left an impression on Kiwi youngster Mark Chapman. In just his second appearance for New Zealand, the 23-year-old had made his way to 16 from 13 balls before copping the brute of a delivery. - The 488-run aggregate is the second highest ever in international T20s, falling one run short of the total scored in a match between India and the West Indies in 2016, the same match in which 32 sixes were belted. - In scoring 105 off 54 balls, Martin Guptill racked up 2188 career runs in T20 internationals, making him the leading run scorer in the format. He raced past Brendon McCullum, who held top spot before him with 2140 runs. - Australia's 91 runs scored in the powerplay is the equal most ever scored in the opening six overs of an innings. The Netherlands and Ireland are the only two other teams to score 91. - This is the first time both opening partnerships in the same T20I have been worth 100 or more. Guptill and Colin Munro put on 132 together while David Warner and D'Arcy Short combined for 121.